There are many different types of privacy barriers you can invest in. The typical fence such as a white picket fence, or you can get more creative and consider adding a natural fence such as evergreens. It all depends on what you want your landscape to look like. Some people like the natural look of trees, while others enjoy the look of wooden fences to add privacy. Here are the different kinds of privacy barriers. There are many different types of living fences you can choose from. They can be large trees, small trees, hedges, or shrubs. Although living fences can grow to be very tall, they do take time. Often times they start really short and small and, in a few years, they start to grow as tall as your house. 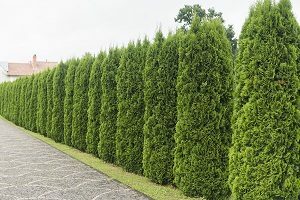 You want to be sure you are taking care of these barriers by hiring a professional to prune them each season or cut them back to ensure they aren’t overgrowing. These are a little similar to evergreens and trees in the fact that they are a natural barrier. A common shrub that is used in Massachusetts is called, Boxwood. This is a square shrub that you can plant to go around your entire home or in certain places such as the length between you and your neighbor. If you are looking to enhance the appearance of your landscape, adding these natural features will beautify it. There are many different types of fences you can invest in. Wooden fences are a classic look for any yard and can have lots of versatility from picket fences to larger panels. Aluminum fencing can be designed in many different ways such as a classic picket fence line or wide sections to enclose your entire property or to surround an AC unit. Vinyl fencing is the alternative to wood without the upkeep of a wooden fence. Gravity retaining wall: the most basic design, uses sheer weight and mass to hold soil at bay. Cantilevered retaining wall: also known as a reinforced wall used with steel bars and concrete or masonry. Sheet piling retaining wall: this is usually installed when space is an issue, thin wall of steel, wood, or vinyl is driven directly into the soil. Anchored retaining wall: used to add additional support to any of the above options and for thinner walls. Some of these you can use to just have around your pool if you have one or to go around your entire yard. When choosing between these fences you need to be sure you can keep up with the maintenance for the ones that need it. For example, wooden fences should be stained and painted at least every two years. Without proper care, you will lose the wood when it rots. Privacy barriers don’t need to be boring: they can add a nice touch to any landscape. They are very versatile by being protective but also makes your back, side, and front yard look beautiful. If you are thinking about adding a fence or a natural barrier, be sure to contact the professionals at Greener Horizon. We make it our job to create the landscape of your dreams.